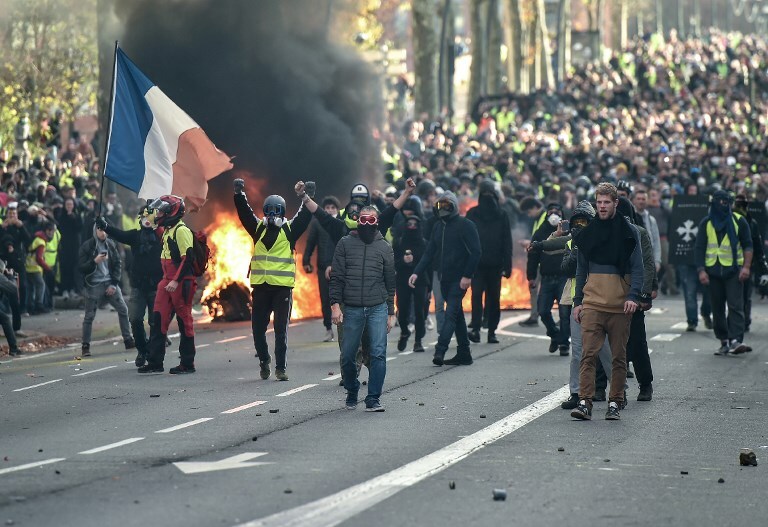 The next few days will be crucial for the gilets jaunes (yellow vests), the French protest movement who have been taking to the streets in opposition to President Macron’s policies – namely increasing fuel prices and the high cost of living. The protesters find themselves at a crossroads. Will the movement continue to grow? Or will it capitulate in the face of the government’s persistent intimidation and false concessions? The answer remains to be seen. For now, however, the gilets jaunes seem quite determined to keep up the fight. Last Saturday was a decisive day for the movement. After three weeks of roadblocks on intersections and roundabouts, “snail operations” to slow traffic, direct action to defy motorway tolls, pickets of petrol stations, shopping malls, ports and logistics hubs, and huge mobilisations in Paris and other large cities every weekend, the movement demonstrated sizeable strength as 135,000 people took to the streets for a fourth day of protests.